At Alpha House, we explore various uses for technology. We use our lab to practice skills presented in the classroom through online programs, and research information on a multitude of topics from current events to authors, artists, and musicians. 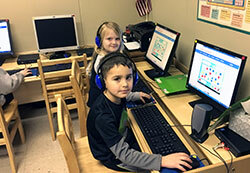 The children practice keyboarding, and in Kindergarten, students work on the writing process.